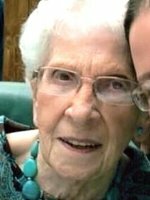 ALBANY – Anna Marie Sgambelluri, 88, of Albany, passed away unexpectedly on Tuesday, December 9, 2014 at St. Peter’s Hospital with her family by her side. Anna was born in Albany, the daughter of the late Angelo and Paula Spagnola Maniscalco. She lived here all her life, and was employed by the Paramount Lounge (family-owned) in Schenectady for 25 years as a Banquet Waitress. Anna’s greatest joy in life was found in her family, which she treasured. Anna is survived by her beloved husband of 66 years, Francis J. Sgambelluri; her children Michael A.Sgambelluri (Judith) of Albany, and Rosemary Planz (Ralph) of Selkirk; her grandchildren Steven Sgambelluri (Maureen) of Albany, Melissa Sgambelluri (Jesse Pacyna) of Scottsdale, AZ, and Ashley Ann Hallenbeck (Michael) of Wynantskill; her great grandchildren Brayden and Carter Hallenbeck, and Luca Sgambelluri; her sister in law Anna Maniscalco; and by many nieces and nephews. She was predeceased by her brothers Joseph, Nicholas and Louis Maniscalco, and by her sister Rose Trapasso. A Mass of Christian Burial will be celebrated Friday morning at 11:00 in the Parish of Mater Christi, Hopewell St. & Hurst Ave., Albany. Relatives and friends are invited. There will be no calling hours. Entombment will be in Evergreen Cemetery in Colonie. In lieu of flowers, memorial contributions may be made to St. Jude Children’s Research Hospital, 501 St. Jude Place, Memphis, TN 38105. Arrangements have been entrusted to the Hans Funeral Home, Albany. To leave a message of condolence for the family, please visit www.HansFuneralHome.com . So sorry to read of your mother’s/grandmother’s passing. Condolences and prayers to you and the family.